Machining Technology teaches students both the science and art of machining. 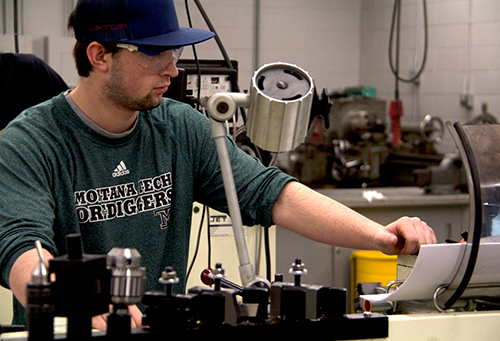 The Highlands Machining Technology Certificate Program allows students to complete the required 41 credits in two semesters and enter the workforce with valuable college credential in the shortest time possible. Students of the CAS in Machining Technology will learn the skills needed to earn the Mastercam Certification and the National Institute for Metalworking Skills (NIMS) Certificate. These industry-specific certifications demonstrate to employers that students have a particular aptitude and breadth of knowledge in machining. The CAS in Machining Technology can also be combined with the CAS in Welding Technology, giving students an Associate of Applied Science Degree in Metals Fabrication. The Machine Technology program provides instruction in the theory and operation of mills and lathes, both manual and CNC, other tools related to the machinist trade, and associated programming. Machinists work in machinery and machine tool manufacturing, small arms manufacturing, and machine shops. Growth in the manufacturing industry and the need to replace an aging workforce is expected to provide opportunities for graduates. In Montana, employment of CNC machinists is projected to increase by 44 percent between 2010 and 2020. Both state and national projected employment growth exceeds the rate of overall projected employment growth. Federal law requires institutions to report information about students who enrolled in Title IV eligible educational programs that lead to Gainful Employment in recognized occupations (G.E. programs). All Montana Tech certificates are G.E. programs. View gainful employment data for machining technology.